The information contained in the various unit reports is taken from official DND Casualty Lists given to the General Public on 26th December 1941 following the capture of Hong Kong. Some of the information such as the individual's rank may have changed while they were overseas. 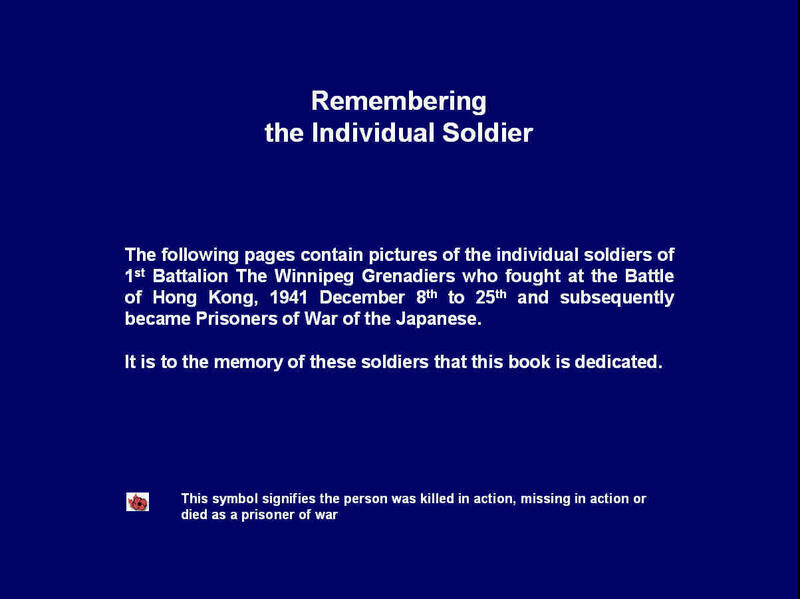 The information on the Winnipeg Grenadiers is taken from official DND Lists when the 1st Battalion landed in Hong Kong on 16th November 1941. Nathan Greenberg has graciously provided the list. Evidence indicates that there was a redistribution of the Battalion once they settled in Hong Kong. The Winnipeg Grenadiers had formed their reinforcements into a fifth rifle company, 'E' Company. The company acted as the reserve company for the Grenadiers. All the members of this company have not been identified as yet. Research is on-going to discover the members of this company. This site, like all HKVCA sites, is dedicated to the memory of our brave 'C' Force members. The existance of this 'C' Force site is due to the work of many interested volunteers who contributed their time, expertise, advice, memories and photos. Vince Lopata who created the original 'C' Force site, was the inspiration for this project. Over the years, his efforts and research produced the definitive reference on the lives of the members of 'C' Force. Click on the thumbnail to read his dedication that was part of the photo galleries he created. Vince has continued to work tirelessly on this project, and can be found commanding the HKVCA colour party at events, and also supervising the Memorabilia Room. Lori Atkinson-Smith, daughter of Hong Kong veteran Harry Atkinson, has spear-headed our Monument Badge project, the aim of which is to place a Hong Kong badge on each and every Hong Kong veteran's gravestone. She has contributed her efforts and research to this site in order to ensure that the Individual Report for each soldier is as complete as possible. David Peebles is one of our programmer-developers who converted some amateur web code into pages that actually worked. Mike Babin, son of Alfred Babin, RRC - who dedicated a significant part of his visit to Hong Kong to photograph all gravestones at Sai Wan and Stanley cemeteries, and the memorial wall at Sai Wan as well. Eugene Labiuk - who has provided clippings, photos, and data on the journey home for the repatriated 'C' Force members. Here's how he occupies his time: "Research and Writing on Operation Magic Carpet, Manila Camp" which deals with the repatriation of British and British Commonwealth Liberated Prisoners of War which came home from the far east through Manila. When this work is finished I will remove the Canadian portion and add those who came home via Guam." Lillian Randall - who has worked tirelessly in researching all members of 'C' Force and has published a treasure-trove of photos and textual information on our Facebook Group "Hong Kong Veterans Tribute. Much of this information has, or will, find its way into our 'C' Force reports. Many, many others who have contributed stories and photos over the years. You are too many to mention individually, but please know that your contributions have found the light of day on this site, to the benefit of all. We hope you're happy with our progress, so far. Please contact us with your questions, concerns, suggestions, and above all, your contributions to add to our reports. There is a lot of work yet to be done.